Okay, so maybe you already know this. But then again, maybe you don’t. After I posted my recipe for Nuoc mam cham (my real food version, that is, of a well known Vietnamese dipping sauce), a few people messaged me to ask – just how do you cook vermicelli so that they don’t stick together?! Oh, friends. I’ve been there. I’ve had undercooked, overcooked, and stuck-together-to-form-a-cooked-vermicelli-slab noodles before I figured out a few tricks to get it just right. 2) It doesn’t matter if you put other stuff in with the noodles – and why not add extra stuff in?! Save on energy by boiling your veg with your noodles rather than cooking them separately. 3) It doesn’t matter if you can’t eat gluten. Rice vermicelli are… made of rice. Duh. Safe for most people. You can even get brown rice vermicelli these days, if you’re into that sort of thing (but click here to find out why I’m not). 4) It doesn’t reeeeeally matter what you put with them. They go with almost anything. They’re awesome with almost anything. And now for the important bits. The bits that DO matter. The hard-and-fast rules of perfect rice vermicelli. 1) DON’T overcook them. This will encourage the starch to make its way out of the noodles. They will stick together. 2) Don’t undercook them either, obviously, because that’s just not nice. 3) As soon as your vermicelli finish cooking, get them out of the water and rinse well with cold water. If you’re boiling them on the stovetop, just tip them into a strainer (over the sink!) and rinse under the cold tap. I like to cook mine in the rice basket in the Thermomix rather than directly in the bowl (refer to point 1 in the list of things that don’t matter; you don’t need to stir them!). Then, when they’re done, I just lift the rice basket out and rinse them straight away. Super easy. This cold-water-rinse prevents them from continuing to cook as you finish up dinner prep; therefore they won’t overcook and the starch won’t start sticking. 4) As soon as you have rinsed them, tip them into a bowl and drizzle with oil (a good couple of tablespoons), and stir well.. This further helps to prevent them from sticking. 5) Pop a plate on top of your bowl (or get reeeeally classy and use a dish with a lid!). This keeps the noodles moist while they wait for everything else to happen. 6) And then eat them. Those are my foolproof tips for cooking perfect rice noodle vermicelli. But because I know so many of you love a real, quantifiable recipe with, like, measurements and stuff… I’ve given you one below. You might want to make the Nuoc mam cham first though! An incredible easy and foolproof way to cook your rice vermicelli. Weigh 1.5L water into your Thermomix jug and insert the rice basket. Weigh peas and carrots into rice basket in Thermomix bowl. Cook for 12-14 minutes, 100 degrees, speed 2. Note: The important bit here is that the water reaches 100 degrees AND continues cooking at 100 degrees for a couple of minutes BEFORE the rice noodles go in. Add rice noodles and cook a further 2 mins and 30 seconds, on 100 degrees, speed 2. Once timer goes off, use the hook on your Thermomix spatula to lift out the rice basket. Immediately rinse noodles and veg well with cold water. 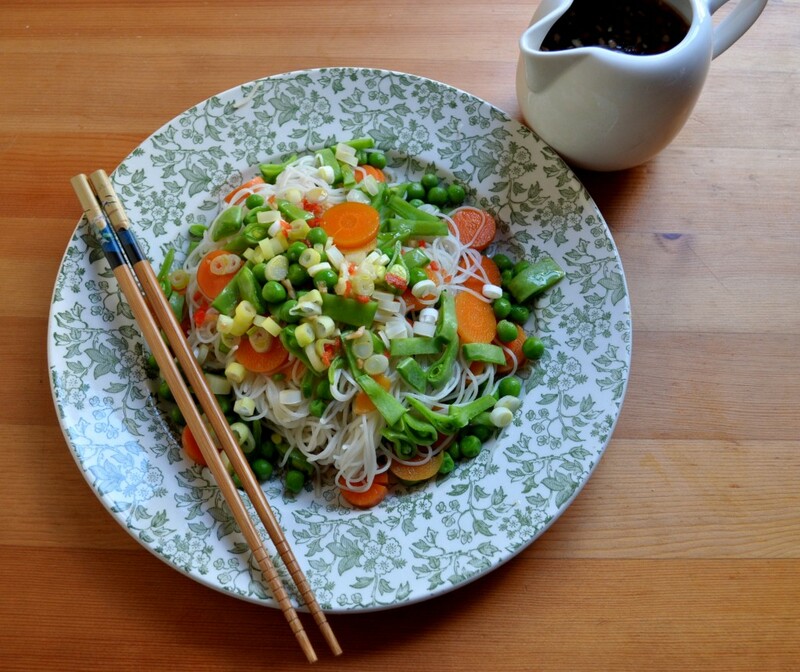 Tip noodles and veg into a bowl, and drizzle with 2 Tbsp sesame oil. Mix well, then cover bowl with a plate or lid while you prepare anything else or set the table. Right before serving, stir through the raw snow peas and spring onions. Serve with a healthy drizzle of Nuoc mam cham (or a good quality Tamari, for kids who don't like spice). What is your favourite rice vermicelli recipe?